This call is very easy to use as it can be worked with one hand. We call it our "Walk and Chew Gum Call." It produces the yelps, clucks, and purrs, and cackles of both the hen and gobblers. The fighting sounds can also be produced on this call. 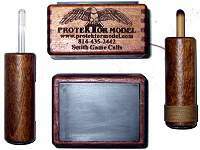 This slate call will produce most all wild turkey calls; such as Yelps, Kee-Kee run of the young turkey, Clucks, Put, Purs, and the Whine. The T-12 Slate Turkey Call is designed with a large sounding chamber that can produce various tones when it is held differently. The striker is stored in the sounding hole for compactness. This call is the right size to be held comfortably, and is equipped with a four foot lanyard and can be carried around the user's neck; keeping the call handy for quick use, preventing loosing your call in the woods. It comes with a wood and all weather plastic striker used in wet weather. This call is similar to the T-12. It is very easy to make the following Turkey Talk, Double Noted Yelps, Kee Kee Run, Cutts, Whine, Cackle, and Purs. This call has wood and plastic strikers. The plastic all weather striker works very well when the Ceramic is WET. Live crow sounds including fighting and sqauling. Long play approximately 60 minutes total. This instructional CD covers locating turkey with a crow call plus competition crow calling. 65 minutes 14 seconds total. Distress cries of an adult crow with actual owl hoots. Also, few crows fighting with actual owl hoots. Total approximately 60 minutes. Barred owling for gobblers with Carl Brown. 17 minutes 46 seconds total. Gray fox distress calls. 58 minutes 56 seconds on two tracks. This CD is the gray fox and wild rabbit distress calls combined. Has a gray fox and wild adult rabbit distress calls combined. Represents a fox and rabbit conflict, and also has a gray fox and wild rabbit distress calls combined. 58 minutes 23 seconds total on two tracks. 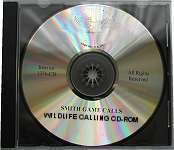 This is a new wild rabbit distress squeals CD. Track 1 has an adult wild rabbit distress squeals and Track 2 has a young wild rabbit distress squeals. 60 minutes 7 seconds total on two tracks. Actual recordings of a hungry pleading bear cub will attract most species of bear. Approximately 60 minutes total. The Sweet Butternut Box Turkey Call is only 6 1/2" long and the sounding sides are from Butternut Wood. We have found that this produces natural turkey sounds, such as, yelps, clucks, purrs, whine, kee-kee, gobble and the cutting sounds. This call has a built in chalk holder and a silencer to prevent unwanted sounds. For the past several years this call has been a choice of the serious turkey hunter. CUSTOM MADE CROW CALL shown is made of FINE GRAINED HARD WOOD with a plastic reed and mouthpiece. This call produces a true to life crow sound with good volume. Any serious Crow Hunter will appreciate this call, and can also be used to make the gobbler sound off. This call is very easy to learn on. Produces all the Turkey Talk. This call brings in predators from close range. Its a medium loud voice like rodents. It calls coyote, bobcat, fox, wolf, bear, badger, cougar, wolverine, and other predators. This call brings in predators from a 1/2 mile away. It's a medium loud voice like a cottontail. You can make loud and soft hurt distress sounds. It calls coyote, bobcat, fox, wolf, bear, badger, cougar, wolverine, and other predators. This call brings in predators from 1 mile. It's a loud raspy voice like a jackrabbit. It calls coyote, bobcat, fox, wolf, bear, badger, cougar, wolverine, and other predators. Creates howl and yip sounds which can be effective for calling in coyote. Great for calling in mallards. Live recording of crows fighting and squalling. An instructional tape on locating turkey with a crow call plus competition crow calling. Tape is side one only. Side One: Distress cries of an adult crow with actual owl hoots. Side Two: Few crows fighting with actual owl hoots. Side 1 and 2 are of barred owling for gobblers with Carl Brown. Side one and side two have gray fox distress calls. This cassette is the gray fox and wild rabbit distress calls combined cassette. Side 1 has a gray fox and wild adult rabbit distress calls combined. Represents a fox and rabbit conflict, and Side 2 has a gray fox and wild rabbit distress calls combined. This is a new wild rabbit distress squeals cassette. Side 1 has an adult wild rabbit distress squeals and Side 2 has a young wild rabbit distress squeals. Actual recordings of a hungry pleading bear cub will attract most species of bear. 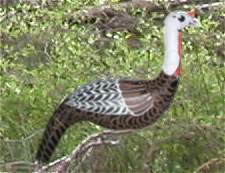 When used with game calls, this hen turkey decoy helps to get the toms into shooting range.